The word “pest” is quite subjective and will differ from person to person dependent on what they like or dislike or potential phobias. Chances are you would have seen a large amount of this particular pest this summer – the common and generally unpopular WASP. Whether you have been spending time in the garden, sitting at your desk in the office or even driving in your car, you would have noticed the unmistakeable black and yellow jacket of a wasp, and (more often than not, though we’d care not to admit it) started to flail your arms in the wasps general direction, hoping that the wasp will retreat, followed by foul-mouthed complaints as to the purpose of a wasp while applying the sting-cream to your arm. CAN WASPS REALLY BE GOOD? Wasps, believe it or not, are able to provide a lot of good in gardens as the help pollinate plants. Similarly to honeybees, pollen can be distributed from plant to plant when it is attached to the wasp’s hair on their les and jackets. Honeybees and bumble bees are more effective of distributing pollen to plants, however wasps can lend a much needed helping hand particular with the decline in bee colonies. Not only can wasps protect your garden’s plants, they can also help protect crops from crop-destroying insects such as grubs, caterpillars, weevils and more! How do they do this? 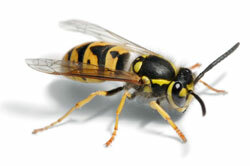 Wasps can kill live crop-pests and clear dead crop-pests, using them as food for themselves and their young. 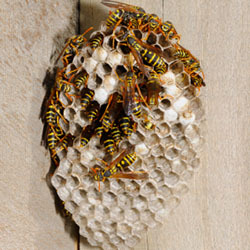 In some cases – farmers have been known to ship wasp colonies into their fields as a natural pesticide for their crops. On the flip side, wasp stings have the potential to be extremely dangers and, in rare scenarios, life threatening. Unlike bees, wasps have the capability to sting the same target multiple times- its reasons for doing so can vary from protecting its own hive or attacking what it deems to be a threat, in some cases when a human has been stung approaching a wasp nest, the wasp emits a chemical which attracts wasps from the colony and signals them to attack, this of course can be result in serious injury if you are in the vicinity of the nest when the wasps become agitated, which is why pest control technicians wear full body protective suits to avoid being stung. In some rare instances, a single wasp sting can be fatal. The venom injected from a wasp sting can cause an anaphylactic shock, a serious allergic reaction where the body becomes hypersensitive, which unfortunately is typical in people with other allergies such as asthma or eczema, particularly in children when allergies have not been identified. So, next time you are applying that sting-cream to your arm after a failed attempt at warding away a wasp, remember that wasps actually do have an important role to play in our eco-system, especially in our current scenario where honeybees are declining.